*4.5 StarsThis is what I love about the Year of the Zombie, getting introduced to the psyches of new to me authors and seeing the unique, novel approach that each one takes to the end of the world as we know it.Sean T. Page goes somewhere completely different with 1975. It’s not about the zombies, it’s not even about human interaction, 1975 is about one man’s head. Cole is one of the lucky ones. Because of his skill set, he was able to get a spot in the bunker and has been saved from the ravenous zombie hordes. Sean T. Page explores Cole’s mind. How does someone handle the isolation? What would you do if cabin fever set in?1975 was a fun book to read. It is filled with mystery, humor and shock. The author put me right in the middle of Cole’s mind. I truly felt his confusion, loneliness and paranoia. I was questioning reality right along with Cole.This is what zombie books are all about. The zombies are not the real monsters. The survivors are all far more dangerous. Man, I was digging on this story. I thought it was far out! O.k., that's about all the 70's speak I've got in me. One very odd, "for me anyways," fun fact. While reading this tale, I was also singing in my head,"as I do" a Bay City Rollers song, and then the author was writing about a BCR poster. I'd like to know the odds on something like that ever happening again! This story was a bit eerie starting off, but slowly I started realizing that something was messed up down in the Ark. I liked how the whole thing played out. The ending was definitely outta sight! Yep, I'd recommend this story and author.Matter of fact, I enjoyed the writing enough to download another of the authors books. 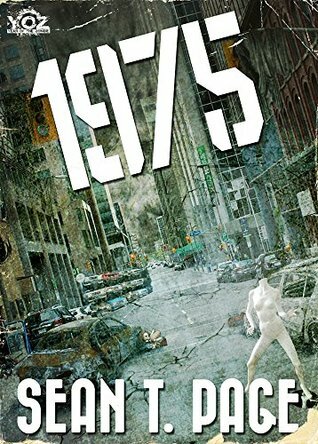 1975 is Septembers offering to the Year of the Zombie. It is turn for Sean T Page to step up to the plate and see what he can deliver.I'm sorry to say this is my least favourite of this serries so far the story seemed shallow and undeveloped when compared to the others. It was interesting with a nice narrative transition near the end. Not a waste of time but it is a read that can wait. Sean T. Page - I am a dedicated zombie survivalist and blogger, The Official Zombie Handbook (UK) was my first published work in 2010. Since then, I have published War against the Walking Dead and the novel Meta-horde. All my work is through Severed Press.A bit about me, I have trekked across Patagonia, the Alps and the Sahara, learning much from the locals on survival and dealing with ghouls. I have been thrown out of various government offices for pursuing my views with such vigour and am one step away from having a restraining order to keep me away from my local Member of Parliament.95% of the population probably think I should be sectioned. The remaining 5% are who I rely on to spread the word – these are the folks who will survive a zombie apocalypse and help to rebuild our country in the aftermath.